I found out about this East Village neighbourhood joint through reading chef Gabrielle’s memoir “Blood, Bones, & Butter“. When my husband came into town for the week to visit me I thought it would be fitting we should go there for our “date-night”. After a few intoxicating cocktails at The Ludlow Hotel‘s bar, we stumbled into the tiny restaurant to a prime window seat. We quickly ordered more wine and the app special: seared duck liver, braised hearts, and fois gras drenched crackers, which were amazeballs. 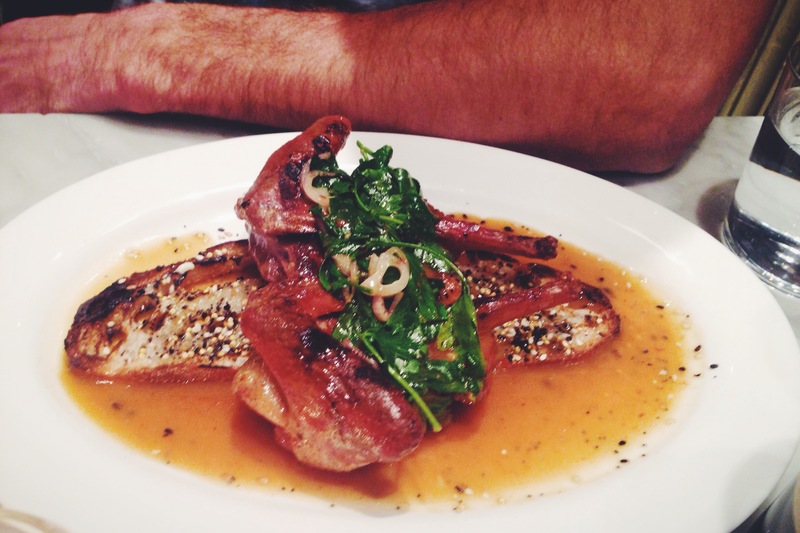 For the main, my husband wasn’t that impressed: he ordered the pigeon, which is apparently a classic dish of the restaurant. I thought it was cooked well, but then again I was pretty tipsy by that point, anything was going to taste great. 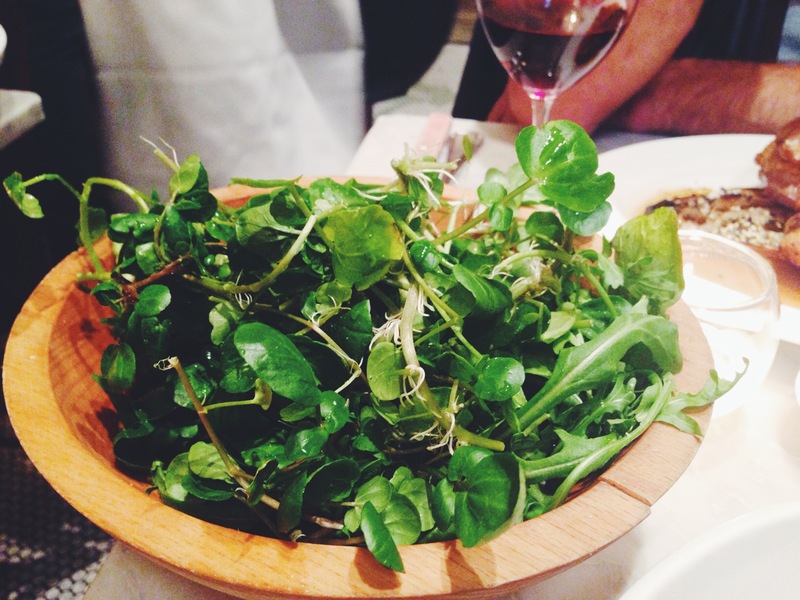 We split a Pinterest-perfect looking watercress salad, and I ordered the black rice cooked risotto-style with duck meat and turnips. Although not as photogenic as my husband’s dish, it was damn good. He thought so too. I think black rice should be the next “big” ingredient. Forget kale or pork belly- give me black rice. I have a saying: if it’s not chocolate, it’s not dessert. And there wasn’t any chocolate on the menu, so we ordered the mascarpone ice cream with salted caramel brioche (and a glass of port to wash it down with- long live alcohol!). The brioche cracked as soon as my spoon hit it, like breaking the crust of crème brûlée. Delish. Trying to recreate mascarpone ice cream at home will be on my to-do list, albeit with chocolate. So, this is a mixed review: I loved my experience, my husband felt “meh”. Maybe go there as wasted as I was and you’ll have a great time. My friend and I were on the hunt for Chinese one night. A Saturday night actually. I had the brilliant idea that we should check out Mission Chinese- they take no reservations, but it was a snowy night, I mean, how crowded could it be? 1hr 45min wait-time crowded to be exact. F*** that. 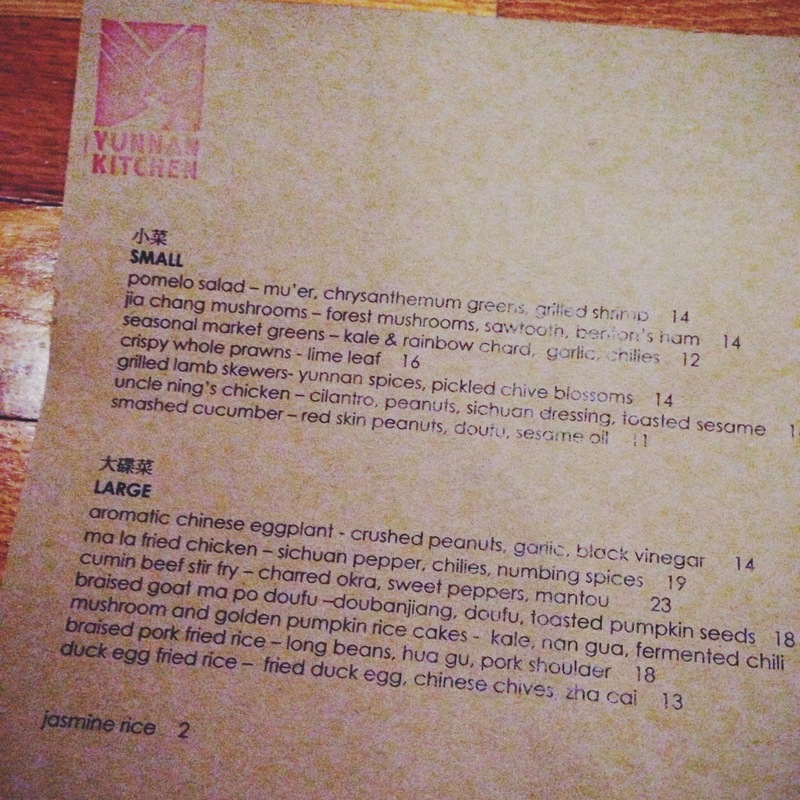 So we walked up Clinton St in snowpocolypse and came upon Yunan Kitchen. “Looks nice, has an “A” rating by the health department, let’s check it out” I said to my friend. I am so glad we did, it was like discovering a little gem in the city without ever having read about it through other reviews. It felt like my little find. 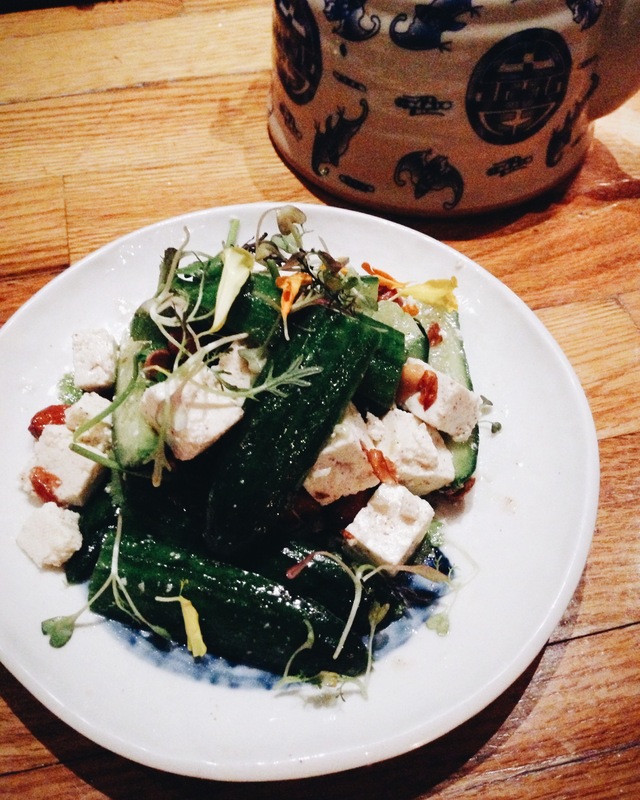 We started off with the smashed cucumber salad: amazing. Super fresh with toasted peanuts. Peanuts are so underdog next to cheerleader-popular almonds. 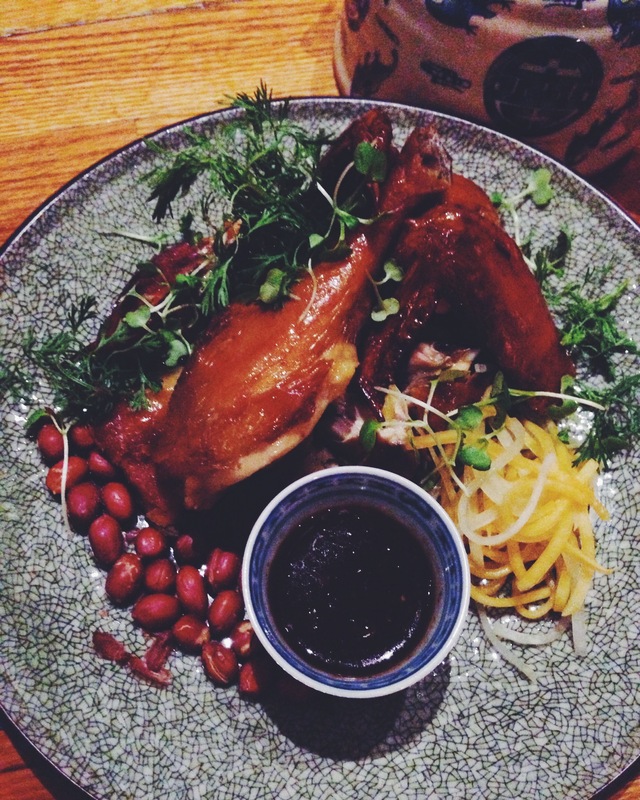 For our mains, we shared the special: tea smoked chicken served with pickled veg and more peanuts. The chicken was cooked Perfectly: brined in tea, braised, then quickly tossed into the deep fryer to crisp up the skin and let the fat ooze into your mouth. Ah-Maz-Ing. My only complaint is that the chicken is sliced, served with the bone on. As a diner, I assume that if my chicken has been cut into smaller portions, the bone will have been taken off, be warned. We also ordered the braised pork fried rice. My friend thought it paled next to superstar tea-smoked chicken, I felt it was everything it said it was going to be: braised pork fried rice and nothing more. Slightly spicey, totally satisfying. Some issues I had with this dish: we were given plastic chopsticks. I just feel that plastic chopsticks are a little harder to manage than wooden, but that’s just me. I also feel rice is easier to eat out of a bowl than a plate with chopsticks. Since we were sharing the big bowl of fried rice, the plates we were given alongside for our own portions were a little useless. Another great thing about this place was that it wasn’t filled with obnoxious diners. There were families, and couples, you could hear your accompanying diner talk without having to raise voices, and it wasn’t ridiculously packed at 8pm when we got there. It did start to get busy around 9:30 by the bar where we sat, but we were leaving anyways. 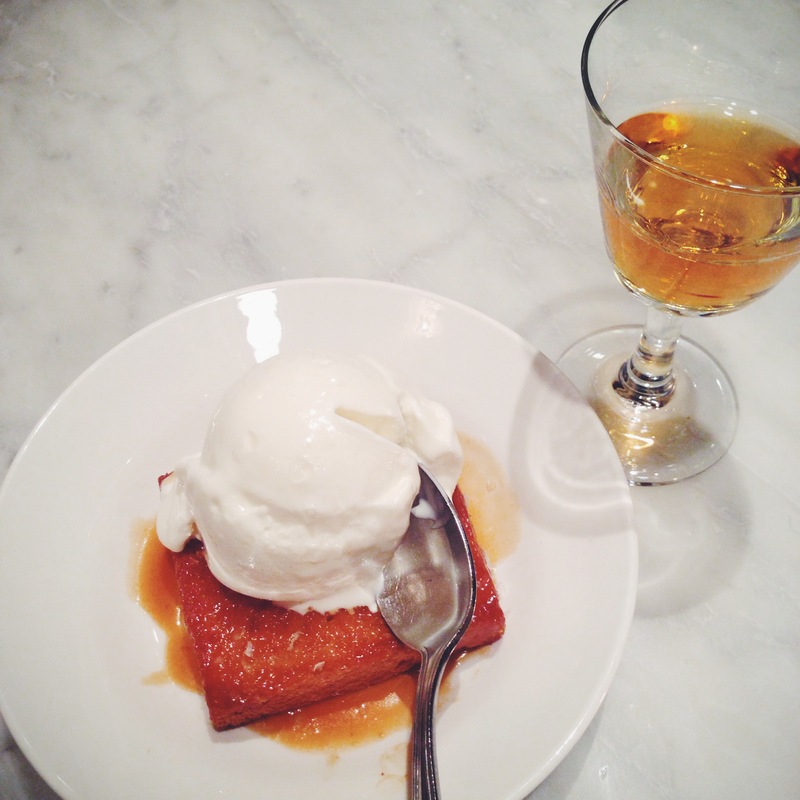 Yunan Kitchen is on Clinton at Rivington. ‘Oh sh*t’, I thought to myself as I was just about to dye some eggs for Easter- I bought brown eggs….. argh. But! Happy accidents do occur, and the brown shell created more muted, earthy tones of the dyes. More Pinterest-friendly I guess you could say. I used Natural Egg Dyes. Although you could certainly make your own natural dye to be used not just for eggs, but to dye wool, etc, I honestly don’t have the time to extract the colour from sources. If you are feeling super Martha Stewart-ish and want to make your own dyes, you could use turmeric for orange, & beets for deep red. Here is a great article that explains how to extract colour. As for making patterns on your eggs, I used rubber bands for stripes. You can also use crayons to mark out drawings (white for white eggs, brown for brown eggs) or use herb leaves to make patterns. For the leaves, place the leaf on the egg, wrap nylon around the egg & leaf, secure, and dye the egg. Remove everything when finished to see your pattern.